Styrene Shelf - 4" x 10"
These Styrene Shelves are perfect for beautifully displaying a single shoe or various smaller items! These sturdy shelves are a made of Clear Plastic Styrene that will compliment any product that you place on it. The measurements for this shelf are 10"L x 4"W, which is perfect for displaying items of various sizes. 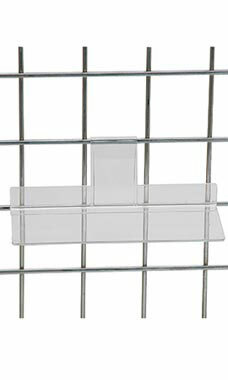 It's the perfect addition to any wire gridwall or slat grid display setting. Essential for retailers! In stock and available for immediate shipment. The look of glass, the safety of plastic. Great piece to put small items on such as purses or shoes. Sometimes you need a little shelf to show something small. This does the trick. These are so reasonable in price and work great for displaying my sandals. I only have to put one sandal out for display on each style.